The Touchmod microphone cost $48.15 (including shipping), and is available to order online through their website. 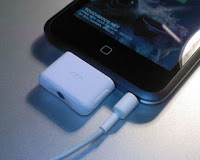 Besides microphone, another accessory for iPod Touch that they sell is the headset which cost $59.40. There's a multipupose button on the headset that can be used to adjust volume, control next track, and start/stop music playback. It will also be used to answer or hangup the VoIP call in the future when the SIP-VoIP application support it. The headset is compatible with all other iPod models, but not with iPhone. With this hack from the Touchmod team, you can kind of turn your iPod Touch into an iPhone. The limitation for iPod Touch is that we can only make VoIP call only when there's Wi-Fi connection, but it's still pretty cool to be able to make phone call using an iPod Touch.